Passengers of a proposed Hyperloop network linking Helsinki to Stockholm would be able to make the trip in 28 minutes compared to a 3.5-hour flight or overnight ferry, according to a new study. Results from the world's first study of a full-scale Hyperloop system was presented by Hyperloop One, FS Links and KPMG at the Northern Light business summit in Helsinki, Finland. The data reinforces the transformational economic and social case for building the proposed 500-kilometer Hyperloop network linking the metro areas and airports of the two capitals, according to the companies. The value of time saved by the network is an $355 million dollars per year. Revenue for the complete system is estimated to be $1.1 billion dollars per year, with an operating profit of $886 million dollars based on a forecast of 43 million passenger trips a year. "Our findings confirm what we have been saying all along: Hyperloop is a time-saver for commuters and an incredible generator of economic benefits for cities and regions along the route," said Rob Lloyd, CEO, Hyperloop One. "Hyperloop One is ready to take the next step and start construction. The Scandinavian region is a perfect location because of its strong economy, mobile population and global leadership as tech innovators. From the early stages, the region has been at the forefront of exploring Hyperloop as a transportation solution." The cost to complete the entire 500-kilometer Sweden-Finland network is projected to be $21 billion dollars, or $42 million dollars per kilometer on average. The UK's London-to-Birmingham fast rail project is currently budgeted at $180 million per mile for infrastructure only. California's high-speed rail project is now between $124 million to $143 million per mile. The Hyperloop network would unlock new economic development in the region, too. Stockholm, for example, has a 13-year waiting list for new rental apartments. Plans by the Swedish government to add 210,000 new commuter homes in the Greater Stockholm can be incorporated into the route, building real estate values around Hyperloop stations that can whisk people to downtown Stockholm in less than 10 minutes. 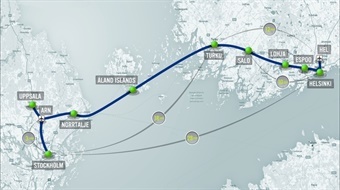 Based on the strength of the study's findings, the city of Salo, Finland, has signed a Letter of Intent with Hyperloop One to become the first Hyperloop city along the proposed Helsinki-Stockholm route. Salo has a strong population of talented engineers eager to fill open tech jobs across the region that a Hyperloop would knit together with on-demand transport.